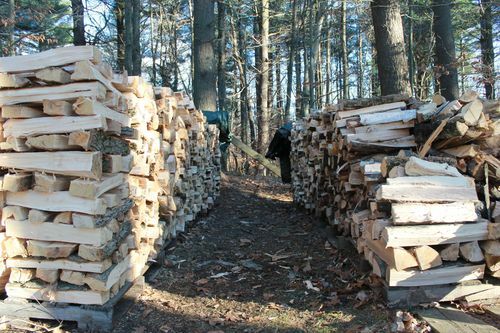 So here it is, the woodpile, my yearly major woodworking project, that, those who also make it know it’s never complete. Made-up of Soft Maple, Beech, Birch and Cherry. This years haul is only half split and as you may notice I’ve already begun digging-in. Well back to stacking and thanks for looking! Nice wood pile. I can appreciate a good pile of wood to burn. For me, great satisfaction comes from sitting in front of a warm fire that you know you worked hard for. I actually enjoy splitting wood by hand in the winter months. Definitely hard work but well worth it. I burn 24-7 And generally go thru 4-5 cords so no more hand splitting for me, plus I only harvest stuff that’s not to conducive to an axe. I’ve been wanting to move back to the country for years ,but I don’t know my back is up to the chores involved with country living anymore. I hope you’ve found a good deal of future projects in that stack. Hey, Doug, I remember harvesting firewood. I am glad that I don’t do it any longer, but more power to you. Doug, how you stand to burn that great looking wood….so many projects in there. Have heated with wood for 45 year and see no end in sight. Mainly birch here, none of those exotic woods you have. 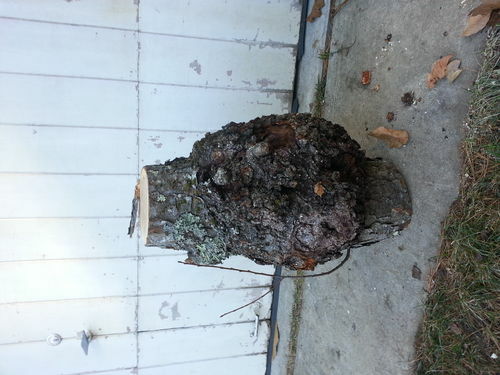 I save choice logs and cut on the sawmill, and of course save some for wood turning. Snow on the ground here so the harvesting etc has to take place in the spring. I suppose I should add, the already stacked pile was mostly standing dead or storm damaged, which gives me some of that really nice splated pieces I’ve proudly turned into display projects. The logs in front are from a deceased Beech that the base was rotten. The maple logs behind the Beech were from a narrly old tree with really no useable lumber (these do make for some nice rescued pieces) and while dropping it it knocked over a fairly nice cherry, I did save the bottom 8’ of it that will be milled into lumber. This is all done as forest management on our 25 ac woodlot.